I’ll give myself a pat on the back for being ahead of the curve on Ultimate Painting, who we caught almost a full year ago at CMJ. The band was so happy with that recording that they offered a few of the tracks from the show alongside some others on a “live tour bootleg” cassette. After last year’s excellent self-titled debut, they went right ahead this year and dropped Green Lanes, which is one of those follow-ups that doesn’t change trajectory, but adds another dozen really good songs to already-strong repertoire. New and old were on display side-by-side at this show at Rough Trade NYC, where the band took the stage and launched promptly into “Ultimate Painting,” “Rolling In the Deep End” and “Riverside” from their first album before the new “(I’ve Got The) Sanctioned Blues” came in for a visit. The band’s love of classic English rock is obvious, and they honor their musical taste with some of the best and most approachable new writing in the genre among just about anyone from their native UK. Of the new material, the band’s strongest entrant might well be the album’s first song, “Kodiak,” a sunny jaunt that shows off the band’s trademark skill at making rock hooks. To wind things up, the band played “Ten Street” from the first album, turning it into a 13-minute guitar centerpiece. When their 50 minutes were up, the band didn’t tease us with a will-they-or-won’t-they encore situation. They had said what they were going to say, and informed us that we could meet them at the merch booth. Anything else would be un-Britishly improper. hi and lo recorded this set with a soundboard feed from Rough Trade engineer Dustin, together with Schoeps MK4 microphones from our usual “FOB” location. The sound quality is outstanding. Enjoy! If you enjoyed this recording, PLEASE SUPPORT Ultimate Painting, visit their website, and buy their albums from Trouble In Mind Records. Alejandro Rose-Garcia, lately of Austin, seems poised for bigger stages these days as his Shakey Graves project starts to take off on the wings of its Nashville connections and blues-rock influences. 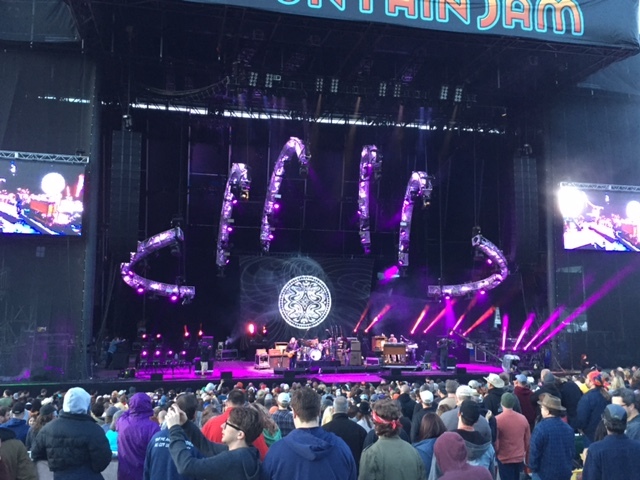 Graves pulled down a sizable crowd for this set at Mountain Jam, and made the very most of it, giving a muscular full-band performance that threatened to overwhelm his latest album, And the War Came, to task. Where that album’s highlights come mostly from his collaborations with Esme Patterson — particularly on “Dearly Departed,” Shakey Graves proved that what he really needed all along was more electric guitar and a drummer who’d really hit the skins. “Family and Genus,” in particular, barely felt like the same song, with some serious soloing and the vocals to go with it. Similarly, Rose-Garcia was a natural with the crowd, sharing a confessional tale and a solid message (always be there for your friends) before launching into the new song “Tomorrow.” There was at least one other new song on offer here, along with several that don’t appear on And the War Came, but what struck me, again and again, was how much more alive this music seems in the live setting, and how much Rose-Garcia benefits from the more “full-band” sound. He would go on to play Bonnaroo a few days after this, and I have no doubt he earned a similarly large following there. hi and lo and I recorded this set with Schoeps MK4 microphones and a high-end Sonosax analog preamp. There is some evident wind noise at points, but for an outdoor recording in these conditions, the sound quality is quite good. Enjoy! If you enjoyed this recording, please support Shakey Graves, visit his website, and buy And the War Came there. 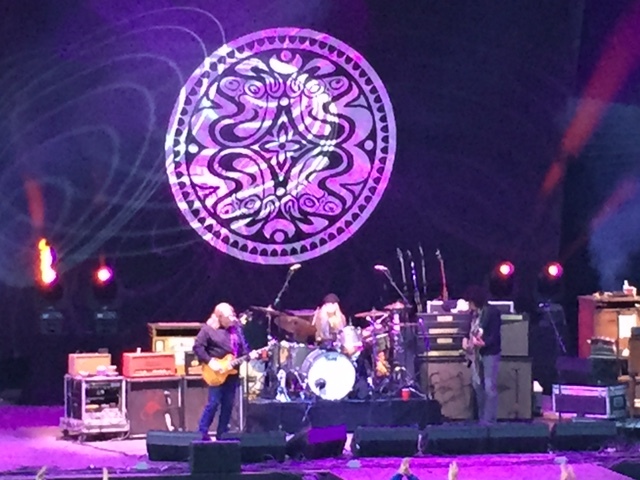 Pretty much everything to like about Mountain Jam flows from Warren Haynes and his band Gov’t Mule. As one of the original founders of the festival, Haynes and his fellow participants in Radio Woodstock built something that grew organically around the kind of music they wanted to make and to listen to. That means 60s and 70s-inspired music with improvisational leanings that usually returns to its classic rock core — a pretty apt description of Gov’t Mule. Since the festival was purchased by an app company, some of that magic has been lost in favor of the expected deluge of commercialization and lineup considerations that tend more toward packing in the day-trippers versus creating a cohesive vibe. So, as irritating as it might have been to realize that Mule would be followed by a derivative band with no business being there, it felt good to enjoy what they were doing, and be grateful that they were still giving it their all. In fact, this was Mule’s second outing at the festival, after their epic “Dark Side of the Mule” set from the night before, to go with their latest album. So, if this set was “only” two hours, Mule can more than be forgiven. Perhaps in a covering mood after the night of Floyd just before, Mule closed this one out with a slew of covers, including “Working Class Hero,” “She Said She Said,” “Tomorrow Never Comes,” and a version of the band’s own “Mule” that featured an extended jam into Stevie Wonder’s “Superstition.” No matter how things may change, you can’t say that Mule doesn’t respect the past. hi and lo and I recorded this set with Schoeps MK4 microphones and a Sonosax high-end analog preamp. The sound quality is quite good. Enjoy! 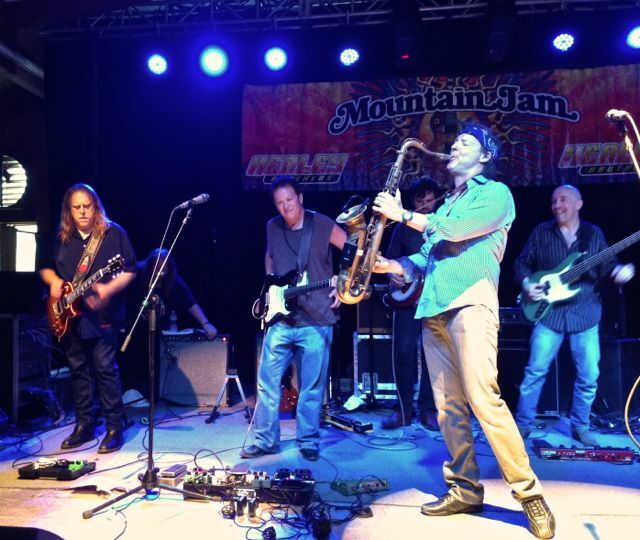 If you enjoyed this recording, PLEASE SUPPORT Gov’t Mule, visit their website, and purchase their official releases from the Mule Store [HERE]. Much has changed since we saw Lake Street Dive open for the Infamous Stringdusters three years ago. Mainly, they’re a much, much more popular band. You won’t see this band, whose 2014 album Bad Self Portraits has proven to be their breakout, opening for acts at 500-capacity venues anymore, or playing “I Want You Back” to street corner passersby, as they did way back in the beginning. As is refreshingly the case from time to time, the band’s success seems to be rooted in talent — even at that show in 2012, the unit’s professionalism was clear. Though at the time I compared them to Alabama Shakes, Lake Street Dive’s south-meets-Motown style leans to the shinier, more theatrical side of things, mostly free of grit. 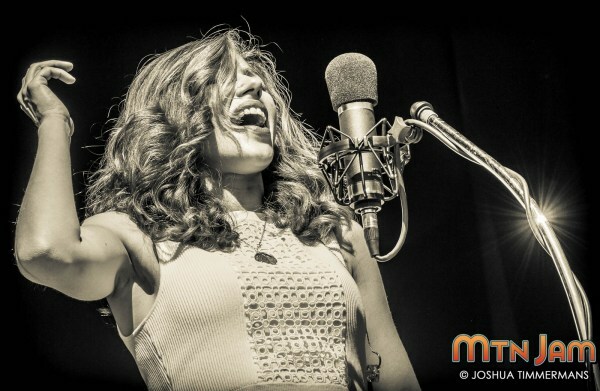 “Theatrical” is the word that comes to mind most often with this band, who perform with both a Broadway-like precision and take advantage of Rachael Price’s similarly trained-sounding voice. Unsurprising detail: the band met at the New England Conservatory. This is what happens when a bunch of serious players and students of jazz decide to take on pop music: It’s a bit like an NFL quarterback deciding to go throw some passes with his old high school team. That made it almost funny to hear Lake Street Dive playing to a muddy Mountain Jam field in the Catskills, delivering effortless vocal harmonies such as on “Look At What Mistake.” If the traditional “jam band” festivals revel to a degree in unpredictability, well, that’s one of many reasons this “Jam” isn’t really a jam-band festival anymore. This was Lake Street Dive’s last show of the tour, as they told us, but you’d have been hard pressed to hear a hint of weariness anywhere from the band. Price did, of course, point out that they try to “eat their vegetables” and treat themselves right on tour, and that I’d believe. She followed that statement, ironically, with the song “I Deserve To Do Something Wrong,” with its distinct Jackson 5 vibe. That was a new song written by the band’s bass player, Bridget Kearney, and it was followed by another new one, “I Don’t Care About You,” from drummer Michael Calabrese. Another plus for this band — they’re as collaborative and consistent in songwriting duties as they are in musical ones. It wouldn’t be a Mountain Jam set without some choice covers, and Lake Street Dive chose wisely, serving up a version of Annie Lennox’s “Walking On Broken Glass” that Price knocked out of the park, as well as jamming into Van Halen’s “Jump” out of the Bad Self Portraits favorite “Bobby Tanqueray,” which itself is one of the band’s harder-rocking numbers. 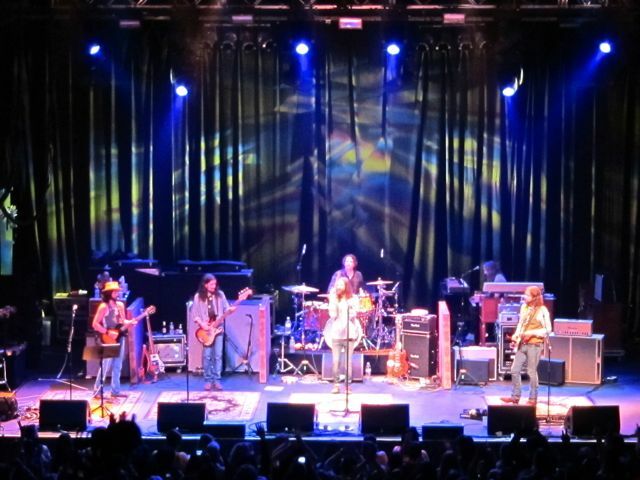 The band closed the set with “You Go Down Smooth,” and those words are as true of the band itself as of the lover described in the song. This is a positive, grateful group of pros who know where they came from. It’s not hard to guess where they’re headed. hi and lo and I recorded this set with Schoeps MK4V microphones and a high-end EAA PSP-2 analog preamp. Given the outdoor setting and distance from the PA, the sound quality is excellent. Enjoy! If you enjoyed this recording, PLEASE SUPPORT Lake Street Dive, visit their website, and buy Bad Self Portraits here. The Hum Residency is a collection of over 30 artists collaborating at Greenpoint’s Manhattan Inn every Monday night in April. In the evening, Manhattan Inn is a bar and restaurant featuring a baby grand piano and rotating pianist in a lovely candle lit room in the back. After 10pm, the space is transformed into a concert venue, tables on the floor quickly whisked away while dinner patrons sitting in custom-made wooden booths, dessert plates and the check in front of them, prepare to enjoy a special evening of music in what will be a standing-room only crowd. Each Monday night features three sets of collaborating artists and for the first act of this night, Brooklyn’s Teletextile and Belle Mare huddled around the house piano. Teletextile is no stranger to intimate sets as we previously featured them for an indoor Backyard Brunch session in 2011 and both bands delivered an equally good performance. For the second act, Renata Zeiguer of Cantina and Cassandra Jenkins shared the floor creating a seven piece ensemble complete with drum kit. The floor was impassable, cables and guitar peddles covering every last inch of available space on the floor, and the artists were literally surrounding my microphones. The final act was the powerful duet of Shilpa Ray amd Deva Mahal. Shilpa is releasing a new album called Last Year’s Savage on May 19, 2015 (Northern Spy Records), and she’ll be playing a record release show at Rough Trade on May 23rd. I recorded this unique set using a pair of Schoeps MK4 Cardioid microphones on-stage in the a classic ORTF setup which was re-positioned for each artist. The audience recording was mixed with a soundboard feed provided by Manhattan Inn’s Engineer John. The audience was incredibly respectful during this intimate set and the results are outstanding. We hope you enjoy! If you enjoyed this recording, please support The Hum Residency by visiting their Facebook page and attending any of their FREE Monday night shows at Manhattan Inn in April!. It’s possible to forget the point of why people go to concerts. We have music at our fingertips at all times — studio releases, live stuff (sites like this don’t hurt), comps, outtakes — it’s all out there. We don’t really need to go to concerts to hear what a band sounds like live, anymore. YouTube and LiveStream and other streaming services promise to beam The Concert Experience right to your laptop. Enter Frank Turner, and his band he calls the Sleeping Souls. What they do at a live show can’t be fully replicated by a download or a stream; it can’t even be replicated one night to the next. Every crowd is different, and so is every night’s vibe. Turner’s live show puts the fans first, and makes getting them involved a priority. He has that rare knack for creating instant community, the kind where even emo-ish numbers can churn up a mosh pit, where people don’t dance or clap along because they’re asked to, but because they want to. So maybe you don’t need to go to concerts anymore. But you ought to. I recorded this set from our usual spot in the Bowery Ballroom with Schoeps MK5 cardiod microphones and a soundboard feed provided by the band’s sound engineer and tour manager Casey. As agreed with the band, we have waited until the record’s release day to offer up this live set. If you don’t already have enough reasons, I hope this recording inspires you to buy Tape Deck Heart, go to Frank’s shows, and support what he’s doing. Enjoy! If you enjoyed this recording, PLEASE SUPPORT Frank Turner & The Sleeping Souls, visit their website and their Facebook page, and purchase their official releases and merchandise including Tape Deck Heart [HERE], at Amazon and at iTunes. And go see their shows! Bluegrass music was born in Appalachia, far from Boston where the founders of The Infamous Stringdusters first got together. Many of the genre’s original players and adherents weren’t professionally educated in music, either – if they were educated at all. The Stringdusters were, but don’t let their skill with their instruments or their professionalism fool you – they are keeping bluegrass alive in the best of ways, paying homage to the past while moving the music into the 21st century. This Bowery Ballroom show was a homecoming for some of the band members who call New York home, and it felt like one, with the band members relaxed but on point as they delivered a nearly two and a half hour set of material from their latest record, Silver Sky, as well as wide-ranging covers that included the Police’s “Walking On the Moon” (covered on Silver Sky) and Pink Floyd’s “Fearless” as well as classic blues and country standards. I had not seen the Stringdusters live before and was kicking myself for taking this long. An evening with these guys makes for an outstanding evening of music. I recorded this set with MBHO KA500N hypercardiod microphones from the balcony. Fortunately, hi and lo was with me to provide a second source to patch about 7 minutes of the set that were missed when I had an equipment problem. The sound quality is excellent. Enjoy!